If Garmin's big stable of running watches didn't already offer up enough stats to feast on, things have got a whole lot more comprehensive with its new Running Dynamics Pod. The $69.99 wearable sensor clips onto the back of your running shorts, tights or leggings, delivering six additional running metrics that can be viewed in real-time on a compatible Garmin watch. I've been taking the Pod out running over the last few weeks to see what it's made of and whether that extra hit of data can actually help improve my running form, and get me running further and faster. The last thing any runner wants is any unnecessary baggage and thankfully that's not something you need to worry about with this dinky wearable. It measures in at 37.6 x 23.2 x 19.2mm and weighs just 14g; you simply don't notice it when you're out running. The Fitbit Zip-looking clip case that holds the sensor in place clamps tightly as well and hasn't gone flying once. There are no buttons to worry about here, it's really all about letting the wearable do the work letting you focus on the running. You don't need to worry about charging it either, as it runs on a replaceable battery that should get you around a year's worth of tracking before it needs changing, something thatt's really easy to do once you slip the sensor out of its lime green case. As for waterproofing, it's been slapped with a 1ATM rating, but it's not going to be much use for swimming. So the good news is that the Pod is compatible with more than one Garmin sports watch. The bad news is that it's still only the latest watches: the Forerunner 935, the 735XT, the Fenix 5 series (including the 5S and 5X) the Fenix Chronos, Quatix 5 and Quatix 5 Sapphire. That unfortunately means popular older watches like the Forerunner 630, the Fenix 3 HR and the Forerunner 235 miss out on the Running Pod love. Once you do get hold of a compatible watch, though, it's really easy to get them paired together. I was using it alongside the Forerunner 935 so all that was required was holding down the Up button on the watch, going into the settings & accessories menu and picking out the RD Pod option. It takes a matter of seconds to locate the sensor as long as it's nearby and then that's it, you're ready to go. 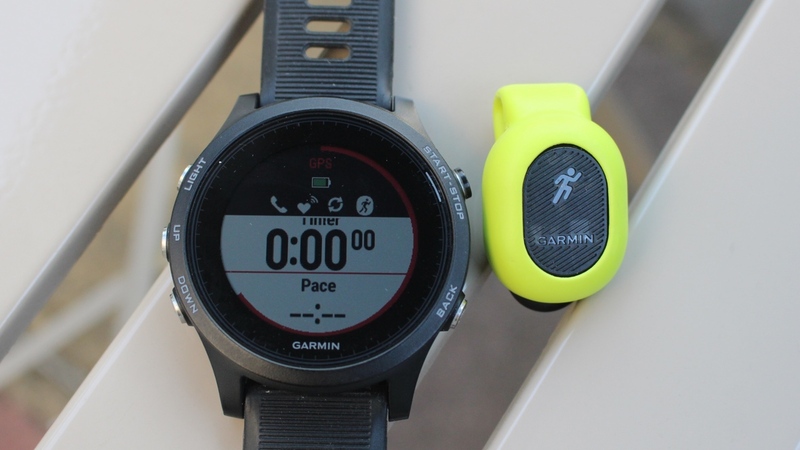 Now when you begin tracking a run as normal, you should see a small running man icon alongside the GPS and heart rate icons to indicate that it's paired to the watch – and now you can start running. To deliver these additional metrics, the Running Dynamics Pod relies on an accelerometer motion sensor that tracks the movement in your torso. From those measurements along with Garmin's algorithms you're going to get six additional running metrics on top of the ones already dished out by your running watch. Those additional metrics are cadence, ground contact time balance, stride length, vertical oscillation, vertical ratio and ground contact time. These are metrics we're familiar with, so definitely have a read of our explainer to get a better understanding of these running watch stats. Bottom line, these are all geared around form and technique, the kind of information that's trickier to deliver from the wrist. Once you get running, you'll find additional data field screens that you can scroll through from your watch. The very simple colour coding UI (red is bad, green is good) means you'll instantly know if you're slacking in a particular area. Once you've finished logging and saving a session, the watch will flash up a prompt reminding you to remove the Pod from your clothes. It's a little thing, but it's a nice touch – especially when you don't want to be throwing the pod in the wash. So the running is done, you've remembered to take off the Pod and now it's time to make sense of the data. Syncing is done like any other session, so you'll need to open up the Garmin Connect app to get a look at your data. When you're exploring the latest run data, the new Running Dynamics should appear in the same section as data on areas like elevation and training effect. Alongside the new metrics you'll see the icon beside it that indicates that the data is also plotted out on a graph to show your progress throughout the session. These graphs can be overlaid with other metrics recorded to start drawing trends. Making sense of the data is something I was concerned about. It's great that you can record it, but it's pointless if you can't understand what it means. Thankfully, these graphs are well designed to make that analysis easy to get to grips with, and I've picked out a few of them below. Let's start with cadence – something that your Garmin watch can already record, but that data is ditched in favour of what the Running Pod delivers. It should be more reliable data as well because the measurements are taken from a part of the body that's much closer to the ground. Cadence, of course, is a measurement of the number of steps per minute you take during a run. 180 SPM is regarded as the sweet spot for runners, but I know that I max at around 175. From the graph above, the green line of dots is where my cadence is good, but unsurprisingly drops later. I know from this particular run that this drop off coincided with a section where the hot conditions were having an impact on my running performance. Ground contact time balance is all to do with achieving a very symmetrical running form, so it's measuring the balance of your ground contact time on the left and right feet. On the watch during a run you can see quite clearly when there's a big imbalance and thankfully I had a 50/50 average, which is ideal. Vertical oscillation is all to do with the 'bounce' in your running action and running more efficiently reducing that bounce to make sure you're not wasting your energy. A typical oscillation is between 6 and 13cm so the green and yellow dots indicate where my average vertical oscillation lies, which is around the 10cm mark. It's also clear from that collection of red dots at the beginning is that bounce was too high, so that's something I can look to address for future runs. As a way to get more running data, the Running Dynamics Pod does everything in a really discreet and unobtrusive way, and I'm sure serious runners will approve of its small stature. Has using it had a positive impact on improving my running form and technique though? That's something I'm not so sure of. While I think the graphs produced from the data are relatively straightforward to make sense of, it's here where a little bit of help from Garmin could go a long way to help pinpoint weaknesses and offer advice and tips to fix that form. Garmin's Insights would be a great fit for this and I'm hoping that the Insights platform will evolve to factor in these additional metrics. If you are a serious runner that craves even more data, you're going to have a lot of time for this waist-worn wearable. Just be prepared to put the work in post-run to make sense of that data and really see those improvements.